Former Gov. Arnold Schwarzenegger spoke at an environmental conference in Austria, where he remarked in German that he misses "the music of Mozart" and a "juicy wienerschnitzel." The 63-year-old added, "I am extremely happy to be here again." 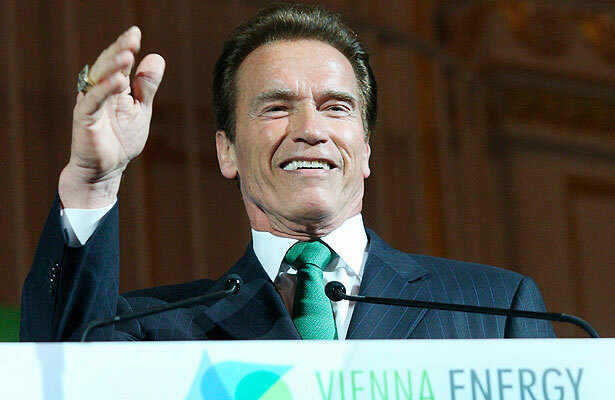 Arnold was given a warm welcome in his homeland at the 2011 Energy Forum, despite his declining popularity in the states after his separation with Maria Shriver and his maid/lovechild drama. The "Terminator" star promised the crowd, "I'll be back," when his hometown of Thal opens the Schwarzenegger museum in a few months. Meanwhile, Arnie's estranged wife, Maria Shriver, has yet to officially file for divorce. Schwarzenegger is already paying child support to Shriver, according to RadarOnline. A source close to the couple told Radar that Arnold is paying "a significant amount of child support. He is also paying for his sons, Patrick and Christopher's private school bills." "Maria wants to get a fair divorce settlement and move on with her life," the source explained. "She has already begun to do so. She and Arnold talk quite often, it would surprise people how gracious Maria is being about the entire situation. Maria doesn't want the kids to suffer because of stupid decisions their father made."